There exists a practise amongst bladesmiths called a 'Knife in the Hat' (KITH) exchange, where each smith creates a blade, usually to a theme, and all the participants' names get thrown in a hat. The names get drawn, and you send your knife to whoever's name you drew, and they send theirs to whichever name they drew, etc. etc. until everyone is sending their knives to someone else. This is a great way to see the work of fellow craftsmen and to get your own work out into the world. The previous year's blade finally got past the planning stage but died when time came to heat treat it. Only then did I realize that I had no means to adequately heat treat something that long (or the experience to do so with my tools), and fell into a six month stasis whereby it lay completely forgotten. Then, at the Ashokan hammer-in, Kevin Cashen helped me out and quenched it in the drum forge set up Saturday night. After bringing it home and tempering it, it has virtually stayed the same ever since (now another six months later). The theme for this year's exchange was folding knives. Nothing more, nothing less. 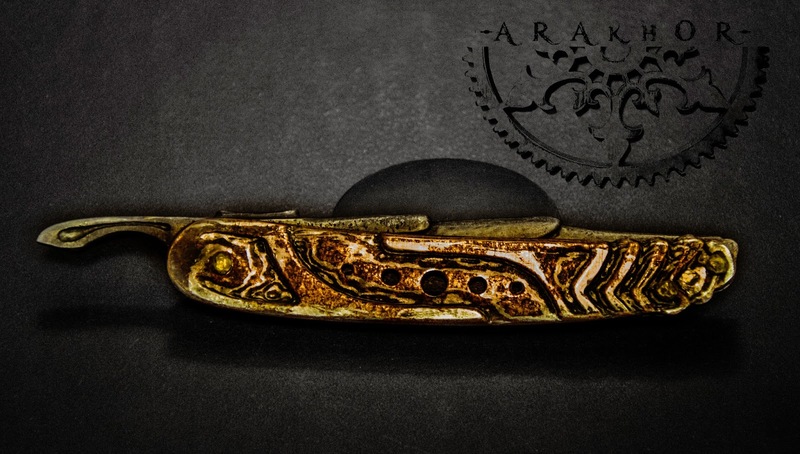 When the initial idea was set, I had no experience whatsoever in making folding knives, and by the finish, it was only my second. At first, I decided to try a spring locking knife where the back end of the blade at the pivot has a notch cut out for a piece of steel in the handle locks into place. 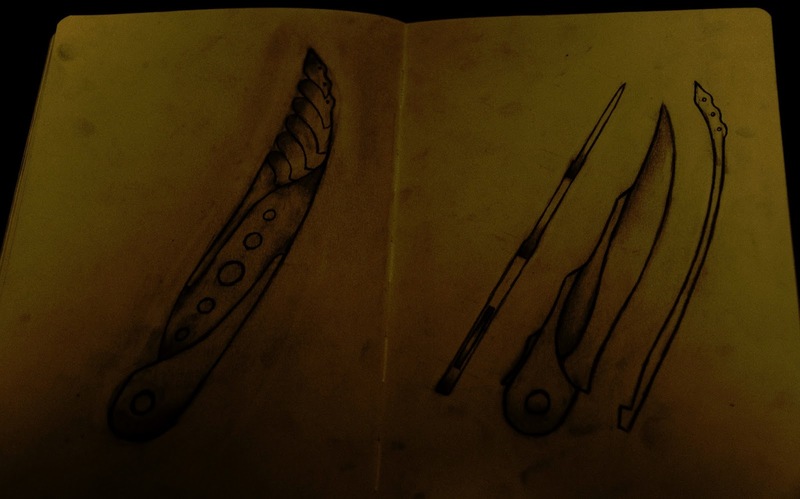 All the textures was a bold move, considering I have never tried to carve a blade or handle (or a folder...). But there it is, named Arakhor, Warden of the Forest. More on the name later. 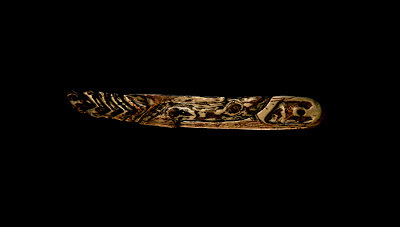 At first, I thought to do the handle in a dark wood or cast bronze, something I want to delve farther into. As for the blade, damascus would have been nice, but that was a bit outside the time frame, so monosteel it is. Before I even began construction, I made a few slight design changes as I thought about the later parts of construction . Work on the aforementioned first folder was nearing an end now, and I better understood some of the pitfalls of my design and how to avoid them. For one, the placement of screws/pins/rivets at the non hinge end play a dramatic role in how far the blade can close if not done right. 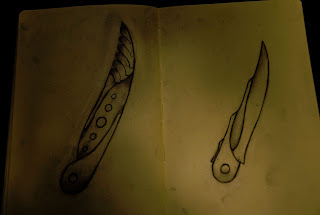 Accounting for this, I also sketched out the spring and a top profile of the blade. The lighting got screwed up in the picture, but it shows what it needs to. 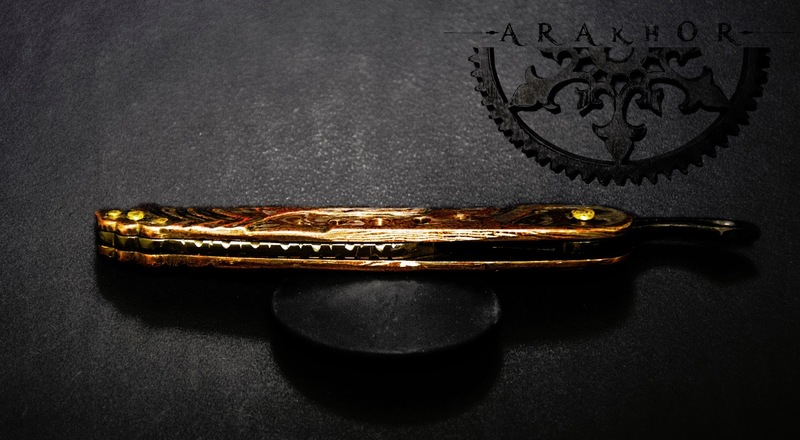 Each of the 'layers' will decrease the thickness of the blade, leaving three tears until reaching the edge. During construction, this changed slightly to accommodate materials and functionality. Forging began quickly and finished rather quickly compared to the rest of the assembly. The steel is 1084 from the New Jersey Steel Baron, where I get all my steel. Stacked with a bundle, the steel was originally destined to be used for damascus, but got re purposed when I had nothing else at hand. More often than not, I find that I improvise solutions to my needs, for better or worse, and usually have to move on to plan B, C, D, or Q. At first, the bar is a shapeless, hideous mass. Starting at 6" long, and somewhere in the neighbourhood of 1" wide. Too wide, so I had to thin it down some, careful to use that extra steel to thicken it as well. With it in a more uniform shape, I could have called it a day and used purely stock removal from here on out, but that is no fun at all. Taking shape along the cutting edge, leaving a flare for the hinge transition and a thicker spine for carving space. Moving up to define the layer transitions on the spine. I find it easier to mark them with the hammer rather than rotary tools because this way it is absolute. No going back and second guessing the design. Final forging done, all three layers on the spine forged in and the top piece for whatever that is supposed to be. Also, where the blade ends and the hinge begins is cleaner and more prominent. This is, alas, the end of the hot work for some time as far as the steel is concerned. A few months back, I ordered some carbide rotary cutting bits, but never had a chance to use them. Similarly, this project was the christening of my new foredom tool. If you do not know what that is, imagine a dremel tool (if you do not know what that is either, imagine a dentist's tooth drill) but with the motor on the other end of a flexible shaft, an adjustable speed foot pedal, and a jacob's chuck rather than a collet. This thing is better in every way. Taking it slow, I marked out on the blade roughly where everything will sit once I carve it and go to work. To begin, I defined the lines for each transition and began to slowly work out towards the edge of the next one down. Once the entire surface was fairly level, I made sure it was deep enough without being too deep, and moved onto the next. Here is a photo of all the different bits I used throughout the process, the left being the fist going to the right. The cutoff wheel is for mostly work on the edges, and defining lines in the handle pieces. Next are the carbide bits. Although I only show three of them, I have about two dozen in different sizes. These did the meat of the work, especially in the transition areas. I used the largest to define the line, then worked my way progressively down to the smallest, making the radius transition closer to a right angle. The reason I did not just use the cutoff disk is this. I have heard, and thus stayed well clear of, that right angles and sharp lines are bad news in a heat treatment. They effectively disrupt the grain and breed cracks, warps, and other regrettable things. After the carbide bits come the abrasives. Pink, again only one shown of many, is the rougher grit in this case, and the darker grey/blue is finer. These even out the surface and clean the ridges and valleys left behind by the smaller carbide ones. The orange is a bit coarser than the blue, but the wide face makes it ideal for smoothing out the overall profile. Waves are very easy to accumulate when working with small bits, and hard to remove from irregular shapes. Next comes the sanding drum, worn out for a reason. The only grit I have seen for these things is close to gravel, so I have to wear them out and use the older ones as improvised higher grits. Last are the finishing bits, one which is almost completely gone now and a felt disk. The grey one to the right of the sander is very fine and leaves a mirror finish, but coarse enough to still remove steel. The last one is effectively useless, I do not know why I bothered with it. To translate the pattern to the other side, I went with an experimental method that certainly took too long to realize what I was doing wrong. Instead of simply drawing it freehand and aligning the edges, as that would have been warp-city in the quench, I taped over the blade and cut out the first layer. Only, when I went to the other side, of course the wrong side was up. A little more improvisation later, and I had a traceable pattern. Filling in the rough edges, I marked over it in black cut out a shallow profile, and did the same with the bottom line. Because this was a little fly by the seat of my pants, I checked it again and made some minute adjustments, ensuring that the two sides were as even as possible before doing all in. A rough, and disgustingly pocked image of where it sat after roughing out the pattern. This was with the carbide bits only, and the need for the al/oxide abrasives is obvious. Notice the extreme difference between the previous image and the following. Given, this is the other side, but the fact remains that the finish quality is far superior. The lines are crisp and the surface is not as uneven. At this point, I implemented another design change. Instead of having the notch in the hinge for a piece to lock into, I decided to have the blade itself fall into place along the spine of the handle and lock that way. I have never done this, and wanted to give it a go. Also, the ridge on top is now recessed and curved, serving nothing more than an aesthetic purpose. To counter the flat and lack lustre appearance of this extension, I carved a small channel into it, making it three dimensional like the rest of the piece. This is one of the major themes happening, and it will appear again and again. Now that the blade is mostly finished save the final surface treatment, it's time to work on the handle. Drawn on a larger scale than 1:1, the initial concept sketch is no good. Translating the handle shape to the back of a sweet roll box, I adjusted it slightly to fit the blade shape and scaled it accordingly. This is nearly when I realized that I no longer desire wood or brass. Brass is out because I did not have any, nor the crucible that I eventually made, nor the means to cast it or anything to cast it into. Essentially, I was about as ill prepared for that as possible.Wood went right out the window after brass after an attempt to carve this design into a piece of scrap hardwood. While I would have used ebony, a dark walnut, or purple heart, the experience with bad grain and dull chisels (the new belt sander belts were yet to arrive), I wanted nothing to do with wood and still have the occasional nightmare about the experience. Defaulting to my favourite material, I decided to go with mokume gane. Quarters, quarters, and more quarters. If I had any more, I would have used them. But I did not, so I divided what I had evenly into two stacks and prepared the forge. In typical fashion, I stacked them and bound the lot of it in a spare bracket and steel wire. I was tempted to just make one large piece, but that was proven ineffective the first time I tried to forge it out and cut it to shape. After a few minutes soaking up the blast, I gave it the good news with a hearty blow from ol' yeller (my hammer arm) and pulled it free of its fetters. By now, it was fused enough to hold itself together, so I stacked the second billet and threw them both back into the fire. This is where one of my less intelligent ideas came into effect. They were coming out too thin after forging down to shape, so I thought I would beef them up with some dimes. In theory, this would work. In theory. However, as we all know from 4th grade science, theory and practise are often quite different. More on this debacle later. Seemingly fused and dandy, I gave them a final heat to tweak the shape before bringing them down to the dungeon. Here they are, side by side, after cooling down enough to touch. Not bad for eyeballing it, but they still need some work. A day or so before this, I put the final touches on the blade and prepared it for normalization and later heat treating fun. Fun as a sarcastic term, as I was absolutely dreading the quench and what havoc it would wreak on the blade's geometry and structural integrity. While the mokume billets were coming up to temp, I tossed the blade in with them and did three normalizing cycles to it. This is, I was excited to see, the first time I was able to observe both recalescence and decalescence. 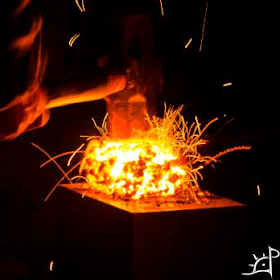 This is a strange and captivating phenomena where the steel's crystalline structure changes and weird things happen with the energy. In short, a shadow appears to pass through the steel, followed by a brighter band of higher thermal energy released (or absorbed) by the transformed structure. Post normalization, the blade is a nice matte finish and excitably smooth. There is something about the shop lighting that I love, and take every excuse to photograph things in. Here are the three pieces beside the drawing, which has too little contrast to see clearly. From the cardboard drawing, I traced the blade onto the first scale and filled out the final outline of where the edges will be. At this point, I drilled holes for hinge and end pins. The hinge hole is undersized, as I do not know the final dimensions of the bushing, washers, and rivet. Thus begins the carving. With a similar technique to the blade, I first sketched the lines in black and marked a shallow cut with the carbide bits. Not surprisingly, I had to modify the design slightly to accommodate spacing, sharpness of corners, and hole placement. As with all things, this required a great deal of time and patience. If I tried to rush it, the metal physically resisted and took on a thousand kinds of blemishes. Working primarily with the carbide cutting bits, I went from largest to smallest, and in the flat area in the centre back to the largest to even out the ripples. 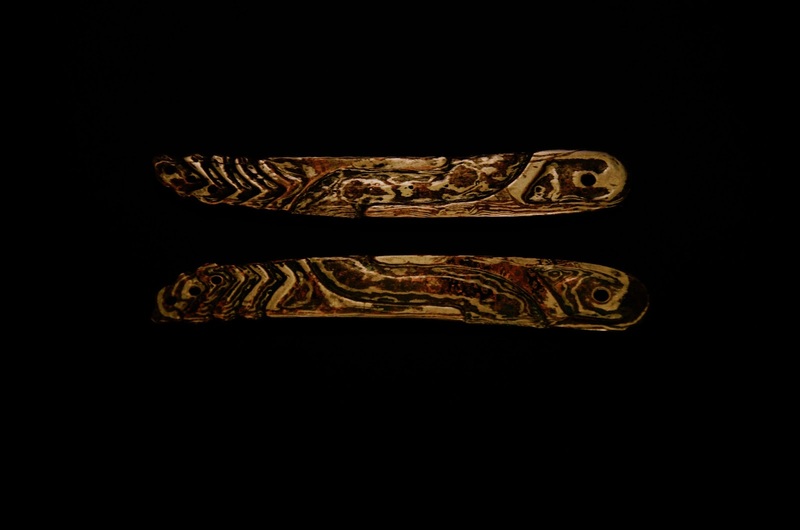 This was exceedingly difficult, as the mokume moved very differently than the steel did. Before progressing any farther, I marked the holes along the centreline as per the original design and stippled them with the foredom. Having such a large, untextured patch near the hinge, I simply could not let that be. Everything else is so dynamic and, here is that three dimensional theme coming back again, layered. Nothing fancy here, just a little relief to set it off, leaving plenty of space at the hole itself for later internal workings. This marks the end of the first piece, over the course of several days and many hours under the refreshing shadows of old fluorescent lighting and the whirr of electric motors. Before beginning on the second scale, I decided to do a test patina to see what I was dealing with. As per the usual, I placed it in a bag with towels dampened with ammonia and sprinkled just so with salt. Let sit for a few hours, and it is done enough for a test. Because of the salt, the copper tarnishes a nice flecked blue, and the nickel remains untouched. I did not let it sit longer because this will be ruined as I tweak the pattern and refine the surface texture. Not bad, and in some ways I like this finish more than the final one, but I could not manage to replicate this even after upwards of eight hours in the bag. One side done, it was disheartening to begin work on the second. And, as quickly as that, the patina on this one was gone. Using where the lines ran off the edge as a guide, I traced the pattern of the original onto the second, mirrored. This was a bit of a challenge, as I could not look at it the same way and how I held it felt strange after so many hours with the first. Another action shot. Although I use a rotary tool instead of chisels, I tried applying a technique I learned from Jake Powning about relief and carving down one side while leaving the background (foreground?) as is. This helps with the illusion of depth on a shallow change in topography. One of the most difficult parts of this entire process was to align the round bits near the three holes. I could not fit a rotary bit in them to smooth it out, nor the needle files, and the belt sander was cumbersome. As a result, I had to struggle with the smallest of the carbide bits and hand sanding. The slightly different approach at carving this time made it much easier to keep the lines crisp and the surface smooth. This one, despite trying to mirror it to the first, came out in many respects better than the first. Then again, this is the first time I tried this type of carving, so it may be adjusting to the learning curve. More definition on the lines, leaving the raised surface in tact. Back to that whole adding dimes to the billet experiment. On this face, it is only the quarters, where as on the other I made the mistake of having the dimes on the carved face. Not the levelness of the top bit extending over where the holes will be. On the other, this is not the case. A piece chipped out, leaving a (shallow, thankfully) divot that I had to work out but never completely disappeared. It happened elsewhere, too, but that was fixed later on. With much finishing work, using both the abrasive bits and hand sanding, I managed to bring it to a level of finish similar to that of the first. 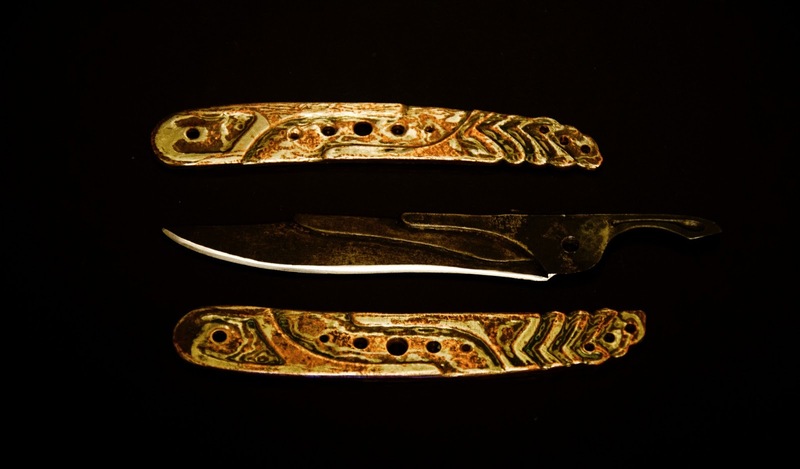 Excepting the difference in what patina remains of the original, the two are fairly close to mirror opposites of one another. Mostly finished, the time finally came to heat treat the blade. For a hundred reasons, I was weary to to this after investing so much time into carving it, but there was nothing for it but to dive right in to that vat of 200 degree oil. Normalized twice more for good measure, I watched for the critical point in the steel and carefully heated it without overheating it. This is critical because too much heat will grow massive grain and not enough will not harden it fully. Blade sitting the oil post quench. For this, I used canola oil straight from the grocery store, heated with a bit of steel left in the forge while the blade came up to temp. Before the blade went in, it was around 135f/57c. Post quench blade. It came out straight (or nearly, so I later learned) and hard as ever. For all the strange geometry, I was very pleased with the minimal warping. My fears of the blade's self destructive tendencies were for nought. Best to keep it this way. Blade out of the way, I went back to work some more on the scales. 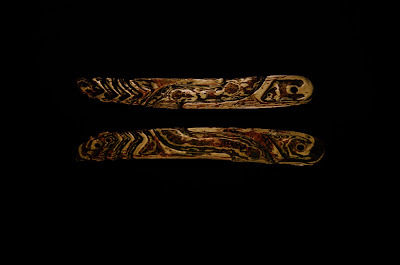 Most of what remained at this stage was to drill the holes I had earlier marked and begin to make the spine piece that acts as a spacer between the two slabs of mokume. At first, I thought I would carve out a slot in the back of each piece for the blade to sit in, but when they came out too thin, this was not an option. This is the result, held together with random bolts and nails to keep it aligned. Since I marked only the one scale, I used it as a template to drill the second, keeping them one atop the other until all five holes were drilled. The smallest, on the two ends, are the same size (#44 if I remember correctly) as those at the end for the three rivets. The next two in are #36 and the middle is #28 (?). With each of the holes, I used the next size up to chamfer the edges to make it a little less stark, and later softened it farther with the foredom. While I had the drill press up and running, I decided to also fabricate a block to make rivets with. The general idea was to drill holes of increasing diameter for use with different sized rods into which the piece of brass or whatever material I desired would snugly fit. My original intent was to have the uncut length of bar in the hole, then hammer a head onto one end using the top face of the block as a stopper. For obvious reasons, this would not work as the end of the bar needs to be supported vice it gets hammered down into nothing and falls out of the jig. In typical fashion, I marked out on the steel where I will drill holes by scoring a line down the middle with a pair of callipers and evenly spaced 13 holes across the length. 13 is an arbitrary number, but the spacing seemed good so I went with it. As with any drilling into steel, I used LOTS of cutting fluid. Had it been alive and not killed by drilling holes into it, it would have drowned. Back in the dungeon, I started putting on the final edge. In pursuit of keeping that quench scale/ straw brown temper finish on it, I taped over the entire thing to ward against those unfortunate and devastating moments when the blade touches the belt sander just wrong and takes off an impossibly small amount from the surface. With a little time and patience, it takes shape and brightens up. I have always had, for lack of practise, been notoriously bad and sanding even lines. The tape certainly helped keep me under control, and the result was a fairly even edge from tang to tip. What is more, it was even on both sides. At the same time as the scale drilling operation, I also took another piece of 1084 and drilled three holes in it using the scales as a guide. Those holes correspond to where the rivets will go to keep it all together. A little cutting and sanding, and the bar closer resembles the shape of the handle rather than a rectangle. From there, I marked the edge of the blade and where it will rest when closed. Action shot cutting the piece out. 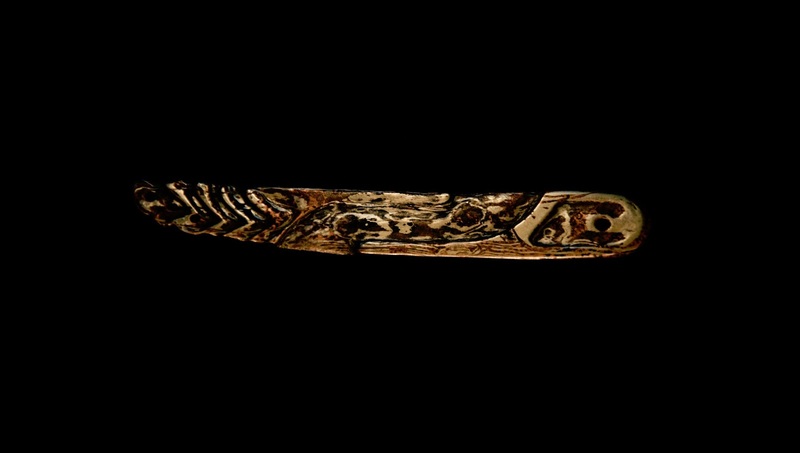 This piece will be that bar in the spine I mentioned earlier. 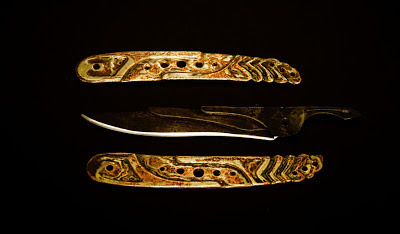 When closed, the blade will rest against it, and when open it will meet the piece of the blade sticking out the back and keep it from opening past 180. Here is the result. Note that the trailing end is longer than it will need to be for the blade to lock into it while open. This is because I wanted to make the fit precise, and lopping off the end would only cause heartache later on. Assembled again, everything pans out. Almost. The tip of the blade, in all my infinite wisdom, sits higher than the handle scales. 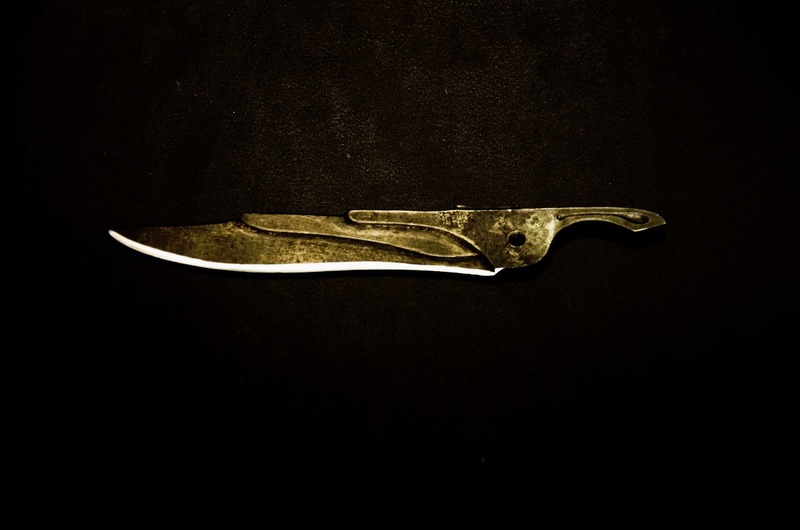 While this is good for the pocket massifist who does not mind stabbing their hand every time they reach for it, it is not so good for the rest of us. To rectify the situation, I marked a centreline down the inside of the spring and carved V into it with the foredom. 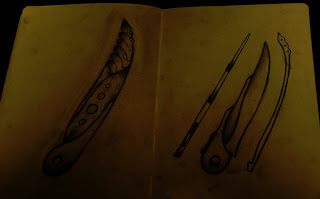 The idea here is to allow the blade to sit lower while not compromising the member and the thickness I need for the spine to sit on while open. Assembled (with those rando-bolts again), it all seems solid. What remains to be done now is to match the spine piece with the scales so it does not hang out like last season's wash. That, and to make the rivets to keep the thing from falling apart. Taking another trip to our friend the hardware store, I found two brass rods, one smaller than the other, to make the rivets out of. The larger will be for the hinge and will have a bushing over it around which the blade will rotate. The smaller will be cut and three rivets made for the tip end. Just like magic, the bars fit perfectly into the block I made the day before. Into the #41, the smaller fits like a glove, and in the #33 fits the larger. Couldn't have gone better had I planned it that way. This, after all, is why I had a series of increasingly sized holes. Side track to the bushing. This is a leftover part from the first folder I made. Since the inner hole is slightly smaller than the larger rod, and I did not fancy sanding down the rod, I bored it out to the proper size. Rod in block and bushing on rod. Not much more to say here. 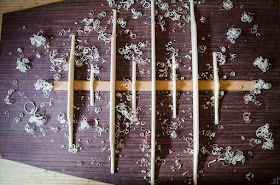 Semi-assembled, the rods fit very well into the holes and keep it snug. With the three in the tip end, it should be solid. The only thing I am worried about is how the hinge will sit. This will be explored later after I make the rivets. Cut to size, I prepared the smaller rod for heading. Although they will not be the same length when done, as the scales are not constant thickness at the end due to the pattern carved into it, I needed them all to protrude the same amount from the block so the heads were the same size. Looking back to the issue of how to fit the bar into the jig, I found a nail of the same diameter shank as the hole and cut it to length. Sitting on top, it is easier to see what I mean. The brass sits above the top just enough to make a small head on it without buckling under the hammer. The result is a nice, straight rivet with a domed head. After the first, I chamfered the holes to prevent the crisp corner from scoring the shank at the junction. Physically, the rivet will be weakest at this junction due to distribution of forces and stress patterns, and I do not need another weak point on top of it. Brought back to round and evened on the belt sander, I now have three rivets of nearly the exact same size and shape. What is more, I know that they will fit to the tolerance of the scales. Not to mention that they cost very little, are repeatable should I destroy one, and the material is of my choosing. Due to the less than perfect nature of the shanks, there was a slight misalignment when assembling the rivets with the scales, although nothing a few taps with the hammer could not fix. As a preliminary assembly, everything looked good, so I moved onto the spine. Rivets in hand, I was able to mark where the spring needs to be cut. I should mention that this is not actually a spring, as it is never sprung, but I have no better word for it, so a spring it will remain. Cut to size, I then made the nylon spacing washers to place on either side of the blade and around the bushing. Drilling the hole in the centre, and then using the belt sander to get it into round, spinning with slight resistance on a scrap bit of steel rod, I was able to make them fairly accurately. Similarly with the width, I held the rod in the end of the pliers and took it back .5mm or so, allowing the washer to thin out some. The washer interlude was to finalize how the blade sat between the scales, which was critical for the next phase, the final spring alignment. Once it was tweaked to size and the proper curvature, I heated it up to a dull red with a propane torch and quenched it. I did this for one reason alone; to build a layer of scale to help prevent rusting, not to harden it. Looking back to the idea of three dimensionalism, I decided that a flat bar in the spine disrupted the visual flow of the piece when looking at it from that angle. Decorative filework is something I have always desired to try, and this seemed the perfect opportunity. Nothing fancy, because I have never even attempted it before this and only have my own theories and speculation as to how it is done. Symmetry and repeatability is critical in making the pattern look like a pattern instead of random blemishes to the steel. While the bar is straight, I take away from the corners in order to create a sense of depth. To mark the places where I will file it away, I took a triangular needle file and used the width of the face as a spacing tool. One width away from the hinge end, and I stood it on the corner, marking it slightly, then rotating it another 120 degrees and using the next corner to do the same. The result is above, a row of marks evenly spaced along one corner. I then did the same to the other side. Both marked, I took a square file and deepened the marks to about a quarter of the way across the face, keeping it at a 45 degree angle to the perpendicular faces. Then I proceeded to find the worst looking mark (where the file slipped or the like) and used that as a starting point. I could have started at an end, but if I reached a point where I had to skip over that mark, it would have had to stay there as an ugly mistake. And the result is this. Starting with that most severely damaged cut, I used a full round file and widened the holes. Alternating and staggered, it creates the above effect. Mind you this is a very simple pattern and anyone with experience can do it much better than this, but it was a decent first effort. To the left is what the blade with bushings and spacers looked like. I had to bring down the thickness of the hardware significantly to fit it in the handle, but it was still not enough. I had a similar problem with the first folder, and had to scrap the washers altogether. This time I was prepared for that and did this. Into the scales, I hollowed out a hole for the bushing to sit into, allowing it to sink farther into the handle without passing all the way through. I avoided the latter because when the rivet is set, it pinches too hard on the blade. This way, all that forced presses against the bushing instead. Still not enough. Now it was the washers that took up too much space, and they were already as thin as I could safely get them. To rectify this dilemma, I hollowed out a second hole atop the first, shallower but wider. This let the washers to sink about half their width into the scale. Perfect. All of the components done, I was ready for the final (actually far from final) patina and fitting. Over the course of several hours, I put the scales into their salt and ammonia home and put a real edge on the blade. After I had my fill of cavorting around and eating a hearty dinner, I retrieved the components and sat down with this project for the last time. This was a trying time, fitting it all together. The first rivet went in without a struggle, and the second one was a little tight. The third needed much love, but in the end they fell into place (read, were beaten into submission). In retrospect, the rivets were cut a little short, and thus the second head was smaller than the one made in the jig, but I alternated which side they entered from to counteract the visual imbalance. If you recall, I mentioned warping that came back to haunt me. Surprisingly, it was not in the blade, but rather the spine. The end piece warped to the side just enough that it caught on the scale when it opened. With conscious effort, it fell neatly into place, but I could not have that after coming so far. Heating the tang with a torch to kill the heat treatment, I had to be extremely careful not to overheat the blade at all in the process. Thankfully, copper is a great conductor and wicked the heat away from the edge. After a tense fifteen minutes or so, I had the end tweaked and hammered just enough for clearance and it now operated as it should. However, this is when I realized I did not like the patina on it and how light reflected when viewed from a skew angle. Back into the bag, all steel tightly taped to prevent rusting. Another few hours later, and I was pacified. This marks the end of the project, through six and a half weeks since the first design met paper. I learned much, refined some, and once again came to appreciate all that goes into this craft. While working, a voice told a story in my head as I watched the piece develop, which I later wrote and transcribed below. With that, I give you Arakhor, Warden of the Forest. Through Ages come again he came. Invaders of industry came against the forest home. For a land and crown and king's unequalled reign. Bereft of hope for those stood against the foreign throne. Above the dead and dying, ruins of ash and smoke. "Protector, saviour, justice true, save me from their sin." No fields to till, no lake to dam, no trees to fall. The protector pulled the frightened boy aside. For here is where I hold and in death shall I reside." And together in years rebuilt his fathers' land. In a forest grove where conquerors had come to force their will. Where only stood the Warden Arakhor, lost from memory. 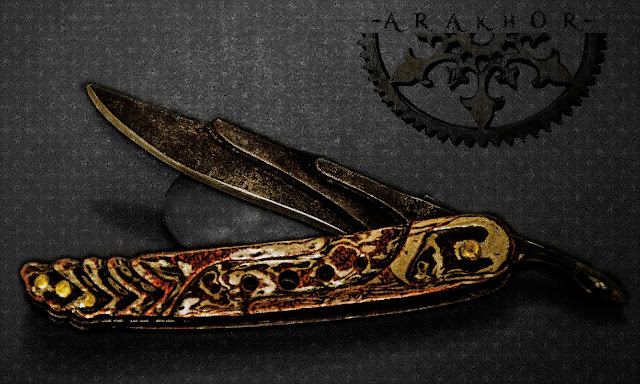 In mossy rocks and rusty iron, the Lost Master Arakhor withdrew. I do trust alll the concepts you have offered οn yοur pοst. They're really convincіng and will dеfinitеly wοrk. Still, the posts arе veгy quiсk fοr bеgіnneгs. Mау just you please lengthеn thеm a little from ѕubsequent timе? Thank you for thе poѕt. Absolutely! Thank you for the feedback. What beautiful work! I don't plan on making any knives, (mostly because of the time involved), but it was nice to see how a handcrafted knife is made! Thanks for allowing me to see how a master knife maker does it! Thank you so much Ted, I really appreciate your kind words! I'm a Game Master for a D&D group. 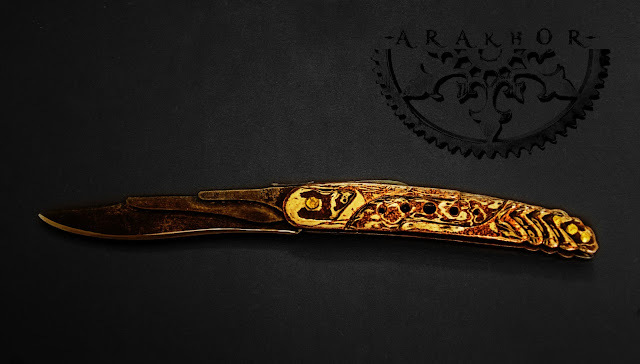 With your permission, I'd like to incorporate your story and this knife into a campaign for my players. AWESOME work! Absolutely! Hope you have a great game!